Action Alert: Senate Foreign Relations Committee Hearing on the Disability Rights Treaty Scheduled for Next Week! You are here: Home / U.N. Convention on the Rights of Persons with Disabilities / Action Alert: Senate Foreign Relations Committee Hearing on the Disability Rights Treaty Scheduled for Next Week! Robert Menendez (D-NJ), Chairman of the Senate Foreign Relations Committee, has scheduled the first of two hearings on the CRPD for Tuesday, November 5th. Senator Menendez and Senator Bob Corker, the Committee’s Ranking Republican, need to hear from everyone. They are logging all calls and contacts made, state by state. Your participation will determine whether we achieve passage of the treaty. The United States International Council on Disabilities (USICD) has launched a new Citizen Action Center to make it easier than ever for you to reach your Senator with the calls, letters, emails, petitions, and social media that will make the difference in this fight: disabilitytreaty.org. The Marathon is almost over. The end is in sight. Now is the time for our voices to be heard. Now is the time for the Senate to feel the power of our Movement. 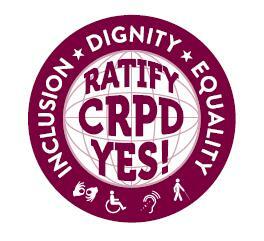 We demand ratification of the UN Convention on the Rights of Persons with Disabilities! We must show the Foreign Relations Committee that we are a strong and diverse community that supports the treaty. Consider attending the hearing if you are able! We need a packed room to show the Foreign Relations Committee that the community is behind this treaty. Time: November 5, 2013. Time TBA. Place: Dirksen Senate Office Building, Room TBA. Online: The link to the web page for this hearing will be posted at the Senate Foreign Relations Committee’s website when it becomes available.